and improving their photography with Full Stop e book camera guides! Price: $5.99 - available now! Take Control of your Sony Alpha a7R III with this Clear and Concise Menu Setup Guide! Sony Alpha a7R III Menu Setup Guide will help you navigate and learn the detailed and complex menu system, as you set up the camera for your specific shooting needs. 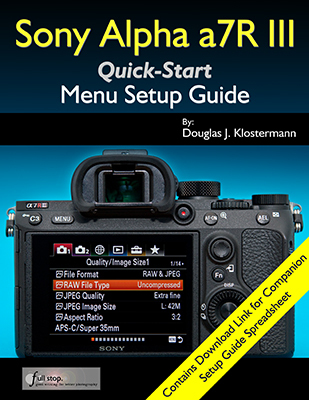 This quick-start guide clearly and concisely explains and illustrates all of the items, features, and functions in the numerous menus, including the Camera Settings 1, Camera Settings 2, Network, Playback, and Setup Menus. Each menu item description includes suggested settings and starting points, to assist you in setting up and using your camera. This e-book guide contains a free download link for the companion Sony a7R III Setup Guide Spreadsheet. The spreadsheet lists suggested settings and recommended starting points for the Settings 1, Settings 2, and Setup Menu items, with full and separate listings for various shooting situations such as Landscape, Sports, Birds, Portraits, and Studio. And you can edit and customize the spreadsheet with your preferred settings. Get up and running quickly, and start to take control of your Sony a7R III and the images you create, with this quick-start Menu Setup Guide! -Includes Descriptions of all a7R III Menu Items, with menu screenshots, plus suggested settings and starting points. -Explains Custom Button Configurations, with recommended settings. -Discusses the Sophisticated Autofocus System, including the Focus Modes and Focus Areas, plus face and eye detection autofocus, and back-button focus. -Contains Download Link to free companion Setup Guide Spreadsheet, where you can review and edit suggested menu settings for various shooting situations. This 160 page e-book menu guide to the Sony a7R III clearly and concisely explains all of the camera's menu items, to help you set up and get the most from your camera. MOBI format for Kindle - please contact me. A well written, professional helpful guide - Brilliant, just what I was looking for! A manual that was exciting, clear to follow, had examples and was used by a professional who gave just the right amount of technical info with explanations of why you use those settings, when to use those settings and so on, all properly explained. The book is a revelation, a joy to follow, well thought through and well written. Nikon should be employing Doug to write every one of their cameras manuals. All You Need - This book, together with the manual that came with your camera, is all you need to start discovering the full potential of the camera. It’s the first guide I've read which has taken me through all the settings in an understandable way. I now feel that I have control over the camera. This is the most helpful manual I've ever used. There is no comparison to the book Nikon includes with the camera, this book outshines it completely. No serious Nikon D600 camera user should be without this. I find myself referring back to this book quite often and find it very easy to find what I need and even easier to understand. Nikon should sponsor this book, and everyone who owns a D600 should have this book. Better Than the Manual - Douglas Klostermann has done a great job of not only producing a very accessible guide but he also offers very useful and sensible suggestions for getting the best results from the camera. Reading the guide was like one photographer talking to another. Thanks Doug. It's clear, concise and gets to the heart of the camera's multiple and often confusing options. Very highly recommended - for experienced user and beginner alike. As previous reviewers have remarked, the official manual is very good on what to do, but not so clear on why. Amazing - Mr. Klostermann has done an amazing job with this book. He's outlined every detail, option, feature, and use of this camera possible, and actually surpasses the expectations of use of the camera. I moved from an old SLR to a modern full frame digital SLR, and found it to be more than I expected. This book really helped me come more to grips on what I was doing wrong. Not to mention the fact that this book, at the price you pay, is a steal. If you have a Nikon D600, I highly recommend you buy this book!!! Valuable Resource and Time Saver - If you're contemplating purchasing this book I would recommend doing so without hesitation. Not only are the explanations behind the individual settings enlightening but the general theory on auto-focus and its associated uses is among some of the easiest to understand that I've come across. Definitely a good investment. As a result of his thoroughness, my confidence in being able to use a new piece of equipment soared. Additionally, the time required to figure out the differences between my previous camera and my new purchase was reduced sharply. Really focuses on the WHY - I found the Nikon manual good for understanding how to set things up but not much on the why - this book really focuses on the WHY. The guide helped me understand why to use specific settings for specific needs. The Custom Settings sections helps to make firm decisions on how to apply settings by understanding the usage of each in addition to knowing how to set them up. More than a Guide - I am a passionate photographer and cinematographer. Not only did I find Doug Klostermann's guide to the Nikon D600 well written and informative, but I really enjoyed the manner in which he shared his image-making philosophy. This is much more than a camera guide and I really appreciate the links to other authors found throughout the text as well as the chapter on suggested photography accessories. A Very Easy to Read but Detailed Guide - I have just bought this camera, and whilst I have been using digital SLRs for years i realize that I am not really getting the full potential out of all those buttons. Now I understand and use them. Excellent Guide to Nikon D600 - So interesting and easy to understand. This book is a must for people like me, serious amateurs. Great Source of Information! - I have been a Nikon user for decades and was of the view that I was very knowledgeable about these products. Still, once I started working with the D600 I concluded that there was a good deal that was still to be learned. This book provided me with the information required, and has proven to be a very valuable resource: well set out, a comprehensive Table of Contents, and well written. The personal preferences and setting recommendations are most helpful. Job well done! A Well Thought-Out, Excellent Value - The author's stated premise for this guide is to enable the user to take control of his/her camera, and he does a fine job of that. The setup, shooting and other menus contained in the D600 offer a wide variety of options that are listed in the Nikon owner's manual, but without the context that is contained in the guide. Importantly, the English syntax is also so good that the reader seldom encounters head-scratcher entries, whereas the Nikon manual often leaves you wondering what they're trying to explain. This is a solid value. Doug Klostermann is a travel, culture, and humanitarian photographer, as well as the author and publisher of Full Stop e-book camera guides. He has photographed for numerous organizations in the United States and Latin America, been recognized by the United Nations Development Programme for his humanitarian photography, and been published in magazines and books including Conde Nast Traveler, Sherman's Travel, South American Explorer, and Viva Travel Guides. Doug is a member of the National Press Photographers Association. View his images at www.dojoklo.com. Learn more about photography equipment and techniques on his blog Picturing Change at http://blog.dojoklo.com/. with this Sony Alpha a7R III Menu Setup Guide. Copyright - Douglas J. Klostermann / Full Stop Media, LLC.